Dale is Director of the Environmental Sciences Program and Associate Professor of Biology at Florida Atlantic University. His research is focused on waterbird ecology and conservation, wetland and intertidal ecosystems, restoration ecology, and the use of birds in aquatic ecosystem management. 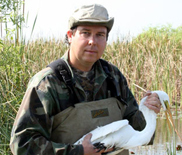 He has a special interest in identifying wetland processes that control wading bird populations and in quantifying how birds respond to these processes through changes in their productivity, behavior, and physiological condition. A hallmark of his work is the use of experiments with free-ranging birds to answer applied conservation questions. He and his students also use information-theoretic approaches to develop wading bird resource selection functions and spatial habitat models linked to the hydrologic management and restoration of the Everglades. Visit his website HERE.